Adult tricolored heron wintering at Merritt Island National Wildlife Refuge, Titusville, Forida. During breeding their bills turn blue and legs reddish. Formerly known as the Louisiana Heron, this slender day-heron is found only in the New World, and is one of 4 North American herons in the genus Egretta. Until the arrival of the Cattle Egret in the 1950s, this species was probably the most numerous North American heron. Although not commercially important to the plume trade at the turn of the twentieth century, the Tricolored Heron undoubtedly suffered because of its habit of nesting with more valuable species. The diet of this heron consists almost entirely of small estuarine and marsh fishes, which it acquires through a diverse array of foraging behaviors. This species is less social in foraging habits than are most other North American herons. 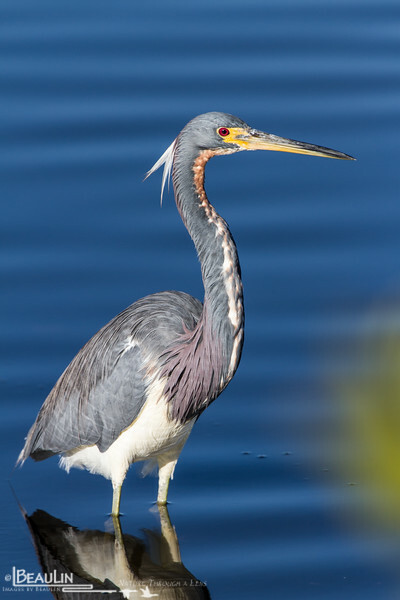 The Tricolored Heron is also more commonly associated with coastal habitats than are all other herons except the Reddish Egret.